CECP Awarded John Irwin Award for third year in a row! CECP Awarded Governor's Distinguished Improvement Award for the 2nd time! Information meetings are a great way to learn more about this amazing educational opportunity, meet with administrators, tour the building, and ask questions. CECP Ranked #15 in the state for SAT scores. We were made aware early this morning that Denver-area school superintendents have decided to close all schools on Wednesday, April 17, due to the ongoing safety concerns. We understand these districts are closing all facilities and cancelling programs for the day. As with most other closure scenarios, we follow Douglas County - In turn, CECP will be closed today. High school student Olivia Farrar has won the prestigious Veterans of Foreign Wars (VFW) post-level competition for her Voice of Democracy (VOD) audio essay. CECP will be closed on Thursday, March 14 due to road and weather conditions. Safety is a top priority. 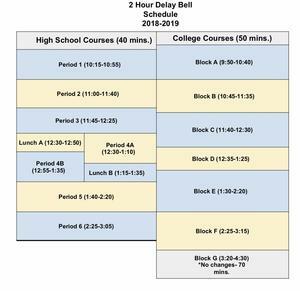 CECP will be on a two hour delay for Thursday, Feb 7 due to the frigid temps. On campus college courses will start at 9:50 a.m. and high school classes will start at 10:15 a.m. Stay safe!